Every part of your automatic garage door requires regular maintenance. Since a lot of the components in these systems can be dangerous to handle without the proper training, our professional technicians can help you out. We can make your door not only work better and be safer to use, but increase its longevity too. Our company has many years' worth of experience in maintaining automatic doors of all types, designs and sizes. Our services cover every brand, from the traditional to the latest market entrants. Whether you have a classic steel model or a custom wooden one, we can help keep it in optimal condition. The same applies to openers. Our experts can take care of even the most seemingly insignificant parts, like the bottom seal, and replace them appropriately when they get worn-out. The spring is the component that's responsible for moving your door up and down. Our professional team will adjust it accurately based on the results from the tests they'll run during the inspection stage of the process, and will lubricate it as well, to help ensure quieter performance. The rest of your garage door's components will be treated equally as good. If our inspection reveals a worn or damaged part, like a frayed cable or one with myriad cuts for example, you can rest assured that we'll quickly replace it. If it proves to be necessary, you can count on us to readjust the travel and force limits of your opener as part of our maintenance service. In case you have a chain or screw drive model, we’ll test out the metal chain or rod respectively, and then lubricate them appropriately. Our specialists will also adjust and/or fix the necessary parts. One of the most important stages of our service routine is to test the safety sensors. These components are in charge of alerting the system when a person or object gets in the door's path, and thus prevent it from closing down momentarily. If they fail our check and prove to be faulty, our technicians will replace them. 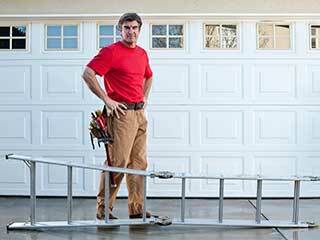 Contact our experts at Garage Door Repair Encinitas to receive the best maintenance services around.